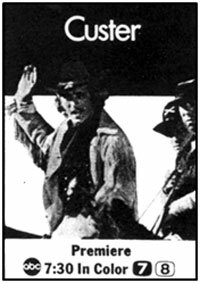 “Custer”, the TV series, ended before its time just as the life of the real General George Armstrong Custer did at the Little Big Horn. 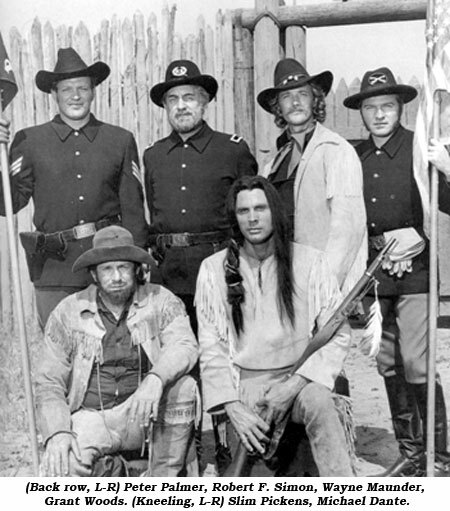 The Wednesday night one-hour color 17 episode series from 20th Century Fox debuted from 7:30-8:30 ET on September 6, 1967, on ABC and was based on the life of Custer during the period 1868-1875, the year before his death at the Little Big Horn. After losing his Civil War rank of Major General, due to forced reductions, Custer was demoted to Captain but was reinstated in 1866 as a Lt. Col. And assigned to shape up and take command of the 7th Cavalry Regiment at Ft. Hays. The 7th was made up of a ragtag outfit of brawlers, former Confederates, drunks and malcontents under the command of Brigadier General Alfred Terry who disliked Custer’s unconventional methods as well as his long-hair appearance but nevertheless supported his methods of dealing with Crazy Horse and his warriors. 31 year-old newcomer Wayne Maunder was cast as the 28 year old Custer (right). Born in Four Falls, New Brunswick, Canada, Dec. 19, 1935, but raised in Bangor, Maine, Maunder was at first attracted to major league baseball but after several unsuccessful tryouts switched to psychiatry when he was at Compton Jr. College in California. But after a year he entered a drama workshop which fired his interest to try his luck on stage. 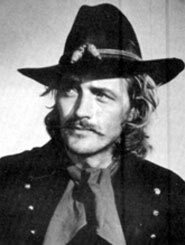 After studying with Stella Adler’s group in NY and working in stock companies, he was seen by an agent who signed him to a contract which led to “Custer”, growing a mustache and long blonde hair for the role. As Michael Dante, who is of Italian heritage, alluded to, “Custer” provoked the ire of Indian organizations. Even before the first episode, Native American organizations began to assail “Custer” as “detrimental to Indians” alleging the “series will stir up old animosities and revive Indian and cowboy fallacies we have been trying to live down.” It was stated, “The depiction of savage Indians slaughtering white men is offensive to civil rights groups.” Even a bear hunting expedition “offended those sensitive to ecological issues.” Activists claimed the distortions of frontier history in “Custer” were pronounced, and the stress on military glory ran counter to a growing public debate by 1967 over the military role of the U.S. in Viet Nam. Everything seemed to belie the show’s success—civilian protest groups, the war in Viet Nam, strong competition from “The Virginian” on NBC (now in its 6th season) and “Lost in Space” on CBS, and the sudden death of series creator David Weisbart. 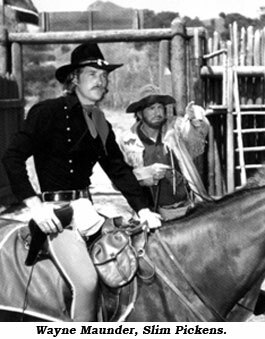 “Custer” rode into TV history on December 27, 1967, a scant four months after its debut. Wayne Maunder moved over to CBS for a two year run on “Lancer” and in ‘73-‘74 was on the Jack Webb produced crime show, “Chase”. His last film was a role in “Porky’s” in ‘82. Since then he’s been involved with independent film production. By the time Michael Dante came to “Custer” he’d been an established guest star on dozens of TV westerns—all the WB westerns as well as “Texan”, “Bonanza” and features like “Fort Dobbs”, “Westbound” and “Arizona Raiders”. A few years after “Custer” he starred in the memorable “Winterhawk”. Peter Palmer took to a singing career, often appearing in “The Unsinkable Molly Brown”. Slim Pickens, 64, died in 1983. Robert F. Simon, 83, died in 1992.